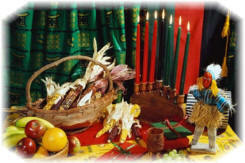 Kwanzaa is celebrated from December 26th through January 1st. It is a seven day festival celebrating the African American people, their culture and their heritage. Derived from the Swahili phrase "matunda ya kwanza" which means "first fruits", Kwanzaa has its roots in the ancient African first-fruit harvest celebrations. However, its modern history begins in 1966 when it was developed by Dr. Maulana Ron Karenga. Inspired by the civil rights struggles of the 1960's, Dr. Karenga conceived a holiday that would bring African Americans together in celebration of their black culture. and celebration of the “Good of Life” (life, family, community, culture, etc.). Each day of Kwanzaa is dedicated to celebrating one of the Nguzo Saba, or seven principles, which represent values and beliefs traditionally found in African cultures. These principles, which are described using the African language Swahili, are shown below. Kwanzaa is a time of celebration, community gathering, and reflection. It is traditionally celebrated in a central area of the home. A table is spread with a beautiful African cloth, and the mkeka is placed on the cloth. The kinara (a special candleholder that holds seven candles), along with six other important Kwanzaa symbols, is displayed on or immediately next to the mkeka. Kwanzaa has seven basic symbols and two supplemental ones. Each represents values and concepts reflective of African culture and contributive to community building and reinforcement. and green for the future and hope that comes from their struggle. The black candle represents the first principle Umoja and is placed in the center of the kinara. The black candle representing Umoja is lit first on the first day of the celebration. On the second evening of Kwanzaa the black candle and the left red candle representing Kujichagulia are lit. On the third evening, the black and red candles are relit and the left green candle for Ujima is lit. The remaining candles are lit from left to right in this manner on the following days of the celebration. This order signifies that the people come first, then the struggle and then the hope that comes from the struggle. Each evening while the candle is lit, all of the people at the celebration talk about what that day's principle means to them and how they have practiced it during the day. Other activities may be organized to practice and promote the principle of the day. After the discussion, everyone makes a commitment to practice the principle throughout the year, and seven "Harambee" (Swahili for "Let's all pull together") are called out. On December 31, families and communities hold a Karamu, a special feast including readings, remembrances and a festive meal. The Karamu feast may include traditional African dishes as well as those featuring ingredients Africans brought to the United States, such as sesame seeds, peanuts, sweet potatoes, collard greens, and spicy sauces. The celebration may be held at a home, a church, or a community center. Kwanzaa - Seven days of Kwanzaa, seven days to celebrate - 1:31/1.1MB. (c) Nancy Stewart - used by permission. Nancy Stewart is a professional musician who has won national and local awards for her songwriting and children's recordings. For more information, visit www.nancymusic.com.